The third nite they were in Albany they stayed at the Hilton which is where I stayed the next nite. So I missed seeing them there by one nite! By the time I checked in they had left for their sound check! Or I chickened out! Take your pick! One of the parking valets said that when they all checked in it was a loud, yakking bunch of Italians! I also talked to some of the members of the orchestra and told them how great they sounded. One of the violinists accompanied Piero and Igna for their duet on O Paese d’ O sole and he was terrific. He put as much emotion in his playing as they did in their singing. For me that was the best song of the concert! Nobody seems to be posting about it. They really acknowledged him, patted him on the back and said grazie, grazie to him! I told him what a great job he did! He smiled, said thanks and seemed a little shy and embarrassed! I said thanks to other members. They are with the Albany Symphony Orchestra. There were thirteen of them. 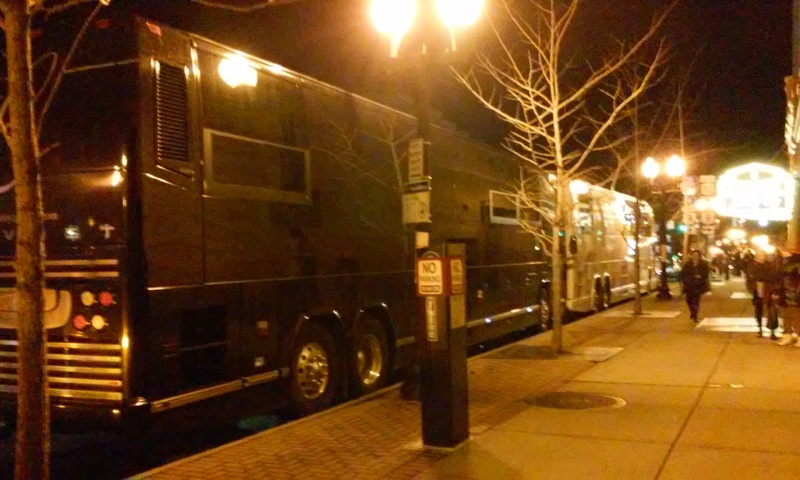 I took some photos of their buses and the equip trucks on my phone. I walked around the corner of the the theater and they were all lined up there. Also a black stretch limo was just closing it’s doors. Alot of serious looking security! I think it was Governor Cuomo. He’s Italian and I’m sure he met them at the Columbus Day parade in NY. He comes up to the Saranac Lake/ Lake Placid area frequently for short rests. He and his daughters ski and hang out. I stopped to get gas and looked over at the next pump and there he was filling up his own vehicle. Just him, no one else around him! No security, nothing! Gave him a thumbs up! 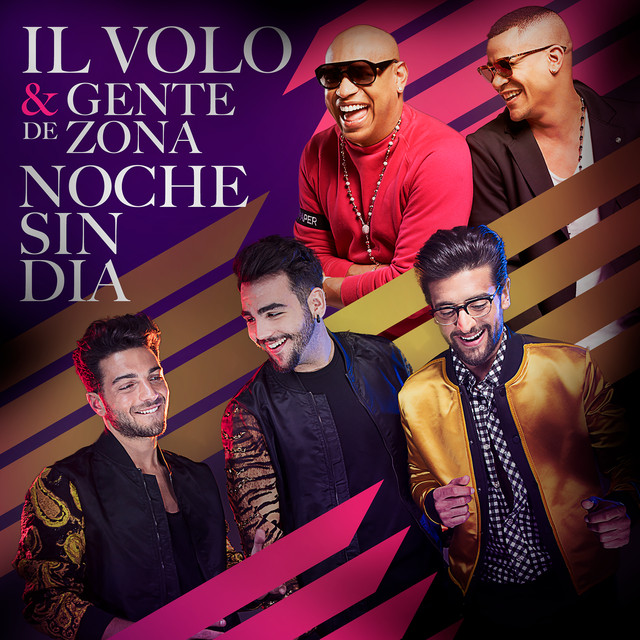 I had watched so many concert videos on the various Il Volo sites that when they appeared at the top of the stairs with the lights and smoke and music it seemed like another video. Such a sense of unreality! I said to myself ” You better wake up! This is the real thing this time!” I was in the seventh row which was great. Close but not too close so I could see them, the band and orchestra. The Maestro was there which surprised me. I thought Albany might be too small for him but sure enough he was there! It was funny to see Igna do his orchestra conducting thing! Holy Cow! his voice just soars! Hearing him in person you can really hear what a powerful, musical capacity he has. Somewhere I read that he is working with Piero’s opera coach. You can here it in his voice, breathing and opened chest that wasn’t there before. I can’t wait to see how well he and the other two develop over the years! And I can’t wait to read what Myron says after the Vegas concert! The orchestra seats were mostly an older crowd and it seemed a little subdued. I was worried the guys would think we were a bunch of duds! I couldn’t see the balcony from where I was so I don’t know how they were reacting. They got quite a few standing O’s but I think a lot of the older ones just couldn’t get up from their seats. There was a lady in a wheel bed type thing at the side and all three of them went off the stage to talk to her. Piero asked her a few questions. Couldn’t really hear. Can you imagine the effort to get her and the bed thing into the theater. There were several sets of stairs to get into the main part of the theater and they must have had to pick it and her up those stairs. A real fan! Over all it was just fantastic! Can’t wait to go to another of their concerts! 14 MORE DAYS. Working on not being a coward and getting a word or two out. Hope Dallas “M & G” is not a rush. Thanks Lynn for sharing your experience at the Albany Concert. You had a great seat for seeing them. It really makes a big difference! Too bad you just missed them at your hotel. 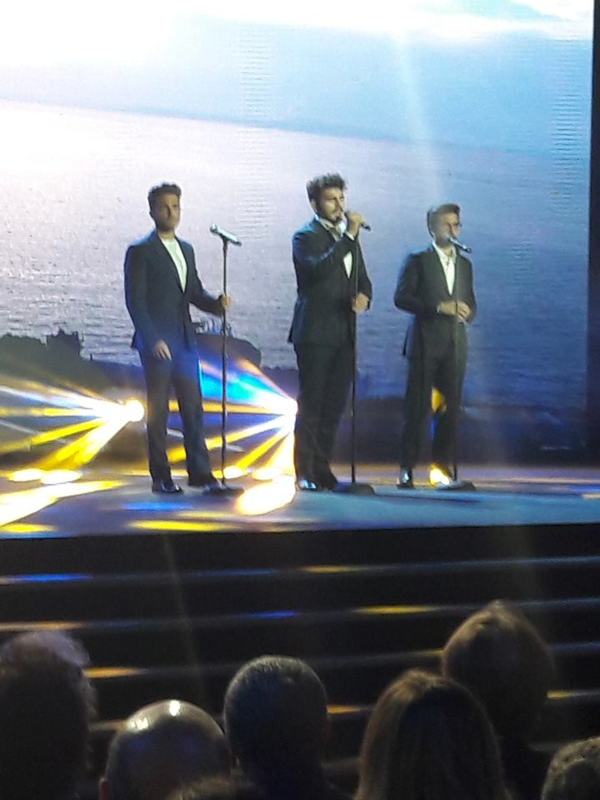 I love the song O Paese d’ ‘o sole and also Core n’grato which Piero and Ignazio sang on their Italian tour. It’s wonderful having the opportunity to see them in person! Hey Lynn, thanks for sharing. It is real! Made me more anxious for TONIGHT! I am so excited, but I don’t hold a candle to Ineke who is sure she will faint as soon as Gianluca steps on stage. Thanks for sharing, Lynn. Love it!!! So great to see our charmers in person!!! They are so sweet & caring!!! Just got my PBS tickets & lanyards on Thurs. looks like we are in the third row! Hope it is not too close! I am a standing ovation person. At the Greek I was just about the first person on my feet! Thought that audience not appreciative enough! At the Gibson We Our Love 2013 Tour we were on our feet clapping after every song!!! We also clapped as each song began!!! Just a small clap, clap. Everyone there that nite loved Il Volo with a passion!!! It was such a beautiful nite!!! Was my 85th birthday & they sang Happy Birthday to me!!! Lynn, thanks for your post! 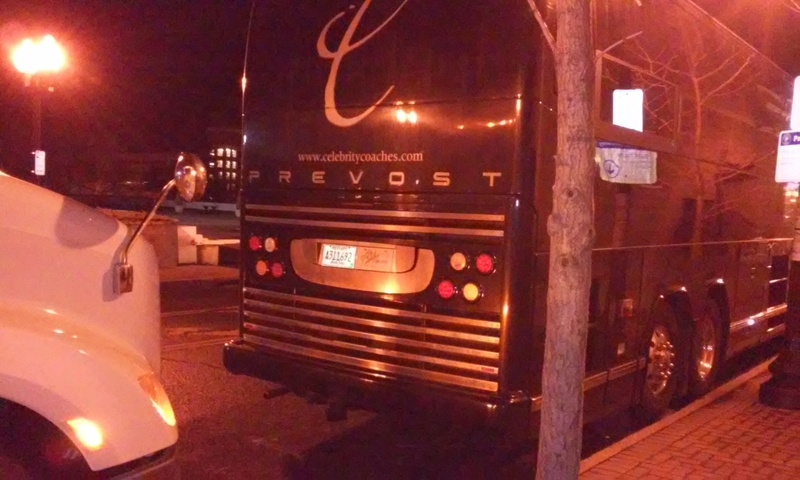 I just can’t understand why their bus didn’t have IL VOLO plastered all over it! ???? and can be a source of light in dark times. I greet you sincerely, dear friend. Hi Lynn! Thanks for the report, I never tire of reading concert reports, they just make me more excited for my concert in San Diego! Too bad you couldn’t have run into them at the Hilton, that would have been way cool. I love it you got to talk to some members of the orchestra. It is also heartwarming to hear how our beautiful guys talked to the woman confined to a bed, pretty heroic action of whomever got her in the concert hall! Like everyone else I can’t understand why there isn’t more PR going for them. Big hug! Connie, my dear husband is fretting over getting my Mom to the concert with a walker. Wait until I tell him about the lady in the bed! He’ll have it easy compared to the folks who brought this fan. I’ll just bet she was determined to make that concert, no matter what! Just 9 more days to wait!! I am getting so excited for my first concert & Meet & Greet. I hope we have a nice relaxed M&G here, & not rushed like some fans have described. I am praying for the very same thing too…only I have to wait 25 more days! My M&G in Saratoga felt very rushed, so I am hoping very much for a different experience. I have a story to share with Ignazio. Plus this time I hope I can get Gianlucas attention and of course, I can’t want to hug Piero! EEEK! It should read ‘I can’t WAIT to hug Piero” not ” I can’t want to hug Piero”…This time I am kissing his cheek too! I think one of the reasons some of the M & G are shorter than others has to do with the schedule. In Orillia, where the M & G was very relaxed and lovely, the concert was scheduled for a weird time (5 o’clock!) and was therefore over by 7. The next scheduled concert was in Montreal which is 5 hours away. They had plenty of time for the M & G and didn’t have to rush off to get to their next stop. Also in Buffalo, the concert was on Friday night, and the next concert was the one in Orillia on Sunday night–and it is only 3 and a half hours away. I would imagine if they have a concert the next night they are more in a hurry. Or a longer trip. What beautiful Boys to talk to the lady in the chair bed. I’m sure she thought they were angels. I did the meet and greet in Orillia at Casino Rama and it was really great, we had so much time, so much better than when they in Toronto in 2014 where we barely had 5 minutes, even got to talk to the parents and Barbara, I keep living it over and over again, it was such a great experience. I don’t know why the M&Gs are so different in different places, I thought they would be all the same. Hi LynnK, thanks so much for sharing your experience. I won’t have a phone to record anything or take pictures either. So I really hope the recording device in my mind is in good working order, so I can remember everything! Hi, guys. I’m new here, but have they been singing “L’amore si Muove” at any of the US concerts? I love that song, but I’ve only seen it listed on the first show they did here, and I haven’t seen any mention of it since. I saw them in Trieste (which was amazing) last July, but that song hadn’t been released yet. I know the atmosphere won’t be the same at the Pearl in Vegas, but I’m sure being ten rows closer and another fantastic show will make up for it! Thanks for your report, especially the “behind the scene” details that you described; interesting about the buses, the musicians, and the lady in the “bed” – can you imagine the logistical maneuvers that had to be made to get that woman into that theater? But you know what, she wanted to see them and she made it happen. This is why we all should really concentrate on what we are seeing and hearing and make every effort to engrave the experience into our souls – some day the hospital bed that we are lying in might not make it to the concert hall in time; treasure every opportunity you have! I agree with what you said about when they first appear through the “smoke” and lights on Grande Amore; for a brief instant you think you are looking at a YouTube video until you realize you are in the same room with them and the excitement starts to rush through you!